The main issue with these cucumber roll-ups is getting nice thin even slices. Unless you’ve got excellent knife skills a mandoline is best for this. A good mandoline not only enables fine slices, but it gets through them exceedingly quickly. 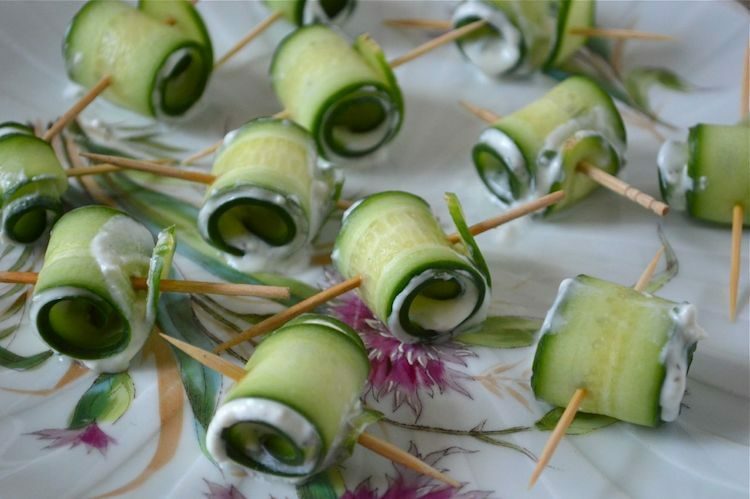 This is especially important if you want to make these for a party and have several cucumbers to slice. The best cucumbers to use are young fresh ones that are neither too large nor seedy but have plenty of that cool-as-a-cucumber flavour. I’m always a little trepidatious about using mandolines. I’ve heard plenty of horror stories over the years and even witnessed one of them. This Chef’s Mandoline 2.0, however, is not in the least bit scary. Yes the blades are super sharp, but the food holder that comes with it makes it perfectly safe to use. In fact the holder means there is very little wastage, if any at all. The last cucumber slice I did was slightly thicker than the others, but still useable. The holder stores neatly on the underside of the mandoline and is held in place by the folded down leg. The mandoline is large (40cm x 13 cm)) and sturdy. I find this makes it easier to use than others I’ve tried in the past. The non-slip leg and feet mean it’s stable and doesn’t slide around. It’s also easy to select the slice thickness you want by turning the dial on the side. You can choose from nine different thicknessess (1 mm to 9 mm), which I thought was pretty impressive. The runway is artfully textured to prevent slices sticking to it. And the bit everyone’s dying to know? Yes, it’s easy to clean too. It can even go in the dishwasher if you’re lucky enough to have one of those. As you’d expect from a good mandoline, there is more to it than the ability to just create normal slices. With 21 blade settings in total, the Chef’s Mandoline Slicer 2.0 can also produce crinkle cuts, waffle cuts, julienne or French fry cuts. The blades are made from Japanese stainless steel and are very sharp. When not in use the blades can be locked to ensure they are not exposed. and won’t accidentally hurt anyone. This is a sneak preview of the Chef’s Mandoline 2.0 as it doesn’t come out until the end of August. It has an RRP of £70. OXO Good Grips make a range of kitchen tools and I’ve been impressed with every one I’ve tried. The vegetable brush and peeler are no exception. You can see what I thought about my Cherry Pitter which comes into its own every cherry season. I’ve been using it with wanton abandon over the last few weeks and have not splattered myself with cherry juice once. 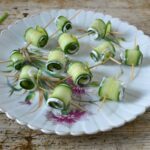 I’m so impressed with these cucumber roll-ups The garlic feta mint filling is gorgeous and the flavours marry well with the refreshing cucumber. The feta cheese makes the filling quite salty, so you don’t need much on each slice. The garlic and mint still manage to shine through, however. Any leftover filling after making the cucumber roll ups can be used as a dip with crudités. I found it also made a fantastic topping for socca, which I seem to be making quite a lot of recently. Summery cucumber roll-ups with a garlicky feta & mint filling. They look impressive, but are super easy to make. They taste delicious too. Slice the cucumber lengthways into long thin strips using a mandoline. I set the thickness to 0.1 mm. Blend the cheese, garlic, yoghurt, mint and pepper until you have an almost smooth paste. I used the brilliant Optimum Nutri Force Extractor. Finely snip in the chives and stir. Thinly spread each strip with some of the spread - it's quite salty and flavoursome, so you don't need much. Roll up and secure with a cocktail stick. You don't want to roll too loosely, but not too tightly either or the spread will be squeezed out. The number you make will depend on the size of your cucumber. This post was commissioned by OXO. I was not expected to write a positive review and all opinions are, as always, my own. This post contains affiliate links. Buying through a link will not cost you any more, but I will get a small commission. Thanks to my readers for supporting the brands and organisations that help to keep Tin and Thyme blythe and blogging. A simple and delicious appetizer! Yes, so delicious, CT almost polished the lot off in one fell swoop. My mother and I managed to get one each! I’m not a fan of mint, do you think the filling would be tasty enough without it? Or what would you put in instead? I think it would still be pretty tasty, but dill would be a good herb to add instead. Or oregano. Thanks Fritha. Let me know how you get on. Yum these look lovely and perfect as a side dish for a sunny picnic as well as great with a glass of bubbly I bet! Ooh yes, a glass of bubbly would be ideal Lucy. So would a picnic if we ever get a dry day again! What a great combination Choclette, feta is one of my favourite cheeses & can well imagine how gorgeous it is with the refreshing cucumber. They look absolutely gorgeous, they’d be a perfect addition to a buffet or a great starter. I can see why you need even strips too, so this is a very useful tool. Thank you for including my rose tart! Thanks Natalie. I really feel I need to host a summer garden party to feature these. They are really good and the mandoline made them so easy to make. I’ve never used a mandolin, for the reasons you mentioned above, but I would be inclined to try his OXO Good Grips one. I love every single utensil I bought from them and I like the fact this mandoline comes with a food holder. These look so pretty and are perfect for a summer party. I really could do with one of those mandolines too as I always have to just use a knife for anything like this and it never looks as neat as I’d like! Thanks Corina. My knife skills definitely aren’t up to the job of cutting thin slices, so the mandoline is super helpful. Me and mandolines don’t get along 😉 Hahaha! It’s a bloodbath whenever I get up the courage to take it out! Sounds like you need this one then. The holder works pretty well. I recently bought a mandolin and I proceed to use it with caution after seeing multiple injuries that can be obtained through its use. I’ve never cut cucumber this way. The rollups look so elegant! Thanks Michelle. If it wasn’t for the mandoline, I’d probably never cut cucumbers this way either, but they work so well. Definitely proceed with caution where mandolins are concerned. These look so lovely and light and fresh. One to add to the buffet menu! They were really good, but I think a summer buffet rather than a winter one would be more appealing. These look just perfect for summer eating when cucumbers are plentiful and cheap! What a lovely tasty filling in them too. Thanks Janice. Would love to grow our own again. Hoping we might be able to soon.